Hi! I’d like to start by congratulating Sandra Schroeder for winning the blog candy offered on the Amazing Mother post! Please email your address to teresa.howe@verizon.net and I will get your prize out to you! Today I have a card I demonstrated at a workshop over the weekend. Thanks so much to Lyssa at Song of My Heart for the great directions and inspiration! 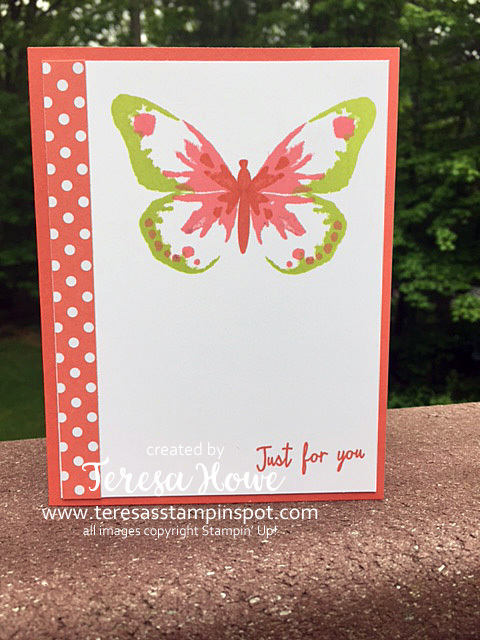 The front of the card features the butterfly from Watercolor Wings. The color combination is Lemon-Lime Twist (one of the new 2017-18 In Colors and available in the Eastern Palace bundle during May), Flirty Flamingo and Calypso Coral. The butterflies pop-up! The color combination for each butterfly is the same as on the front. Just die cut them with the coordinating Bold Butterfly Thinlets. I strongly recommend stamping the body of the butterfly AFTER you die cut them – so the heads aren’t cut off as they are in mine. The butterflies are attached together with a glue dot place at the very tip of the top wings. They will fold down together stacked on top of each other so the card can be mailed! This was a big hit! 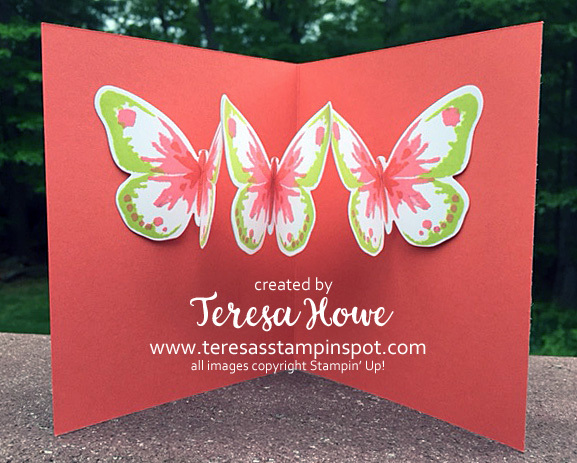 If you don’t already own the Watercolor Wings stamp set and the coordinating Bold Butterfly Thinlets, I highly recommend adding them to your collection! Hi! Today I am hopping along with the Team Stamp It! 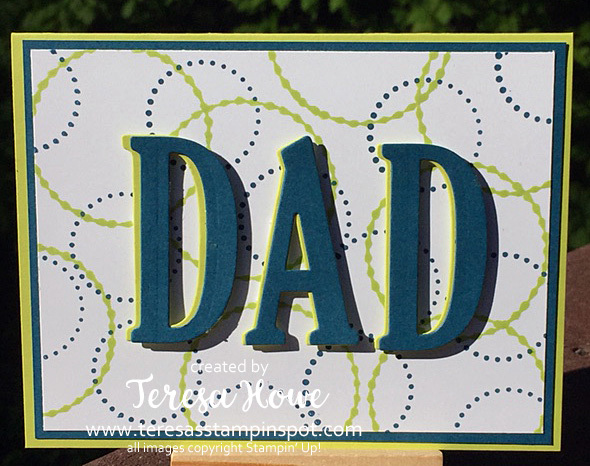 Father’s Day Blog Hop! So excited to be able to hop along today – I hope you are enjoying everyone’s creations! For my card, I decided to use the Large Letter Framelits – these are great to have on hand and can get you out of a bind when you feel you don’t have a set for the occasion on hand. Pretty simple card to make. 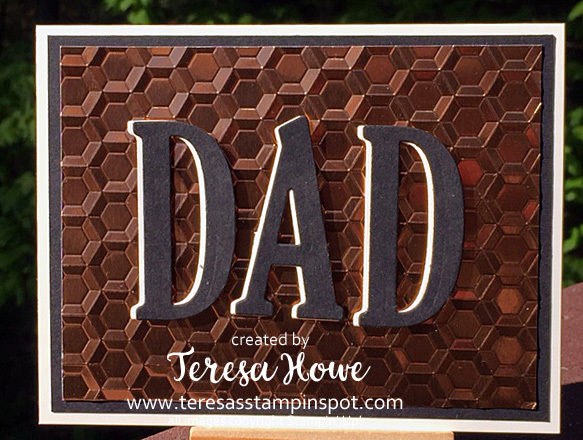 The background is Copper Foil embossed with the hexagon textured embossing folder. Little hard to see the shine in this picture – but it really does pop. The letters are die cut from Basic Black and Very Vanilla. The Basic Black letters are attached to slightly off the Very Vanillas as it adds dimension. These are then attached to the copper foil sheet using dimensionals. 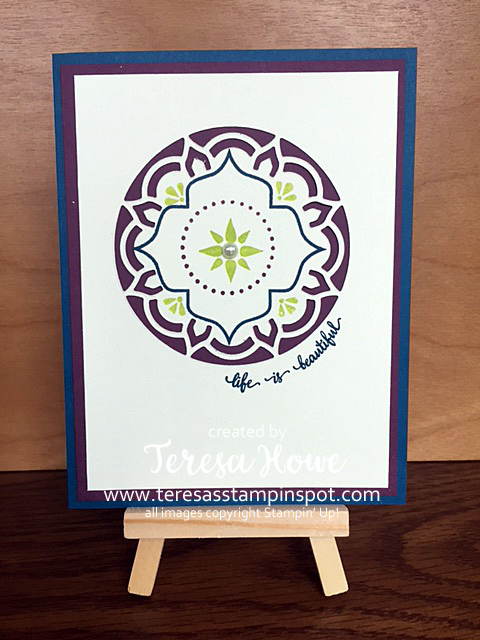 For this card, I used the Eastern Palace stamp set to create my background love how it looks. The colors are Lemon-Lime Twist and Dapper Denim. The letters are cut from the same two colors. 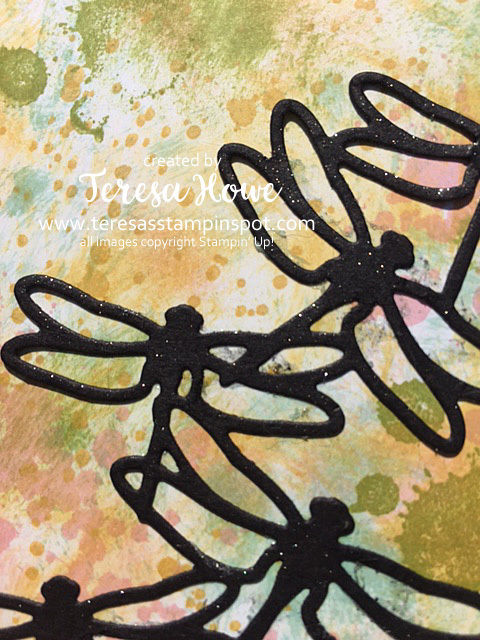 Just wanted to show you could stamp your background instead of embossing it. Hi! Today I am participating in Kylie Bertucci’s International Blog Highlights! Our theme this month is Masculine. I’d love your vote for my card – you can do that here. I decided to combine two of my favorite sets for today’s card. Sad to say – they are both retiring at the end of the month – so if they are not part of your collection – add them soon! 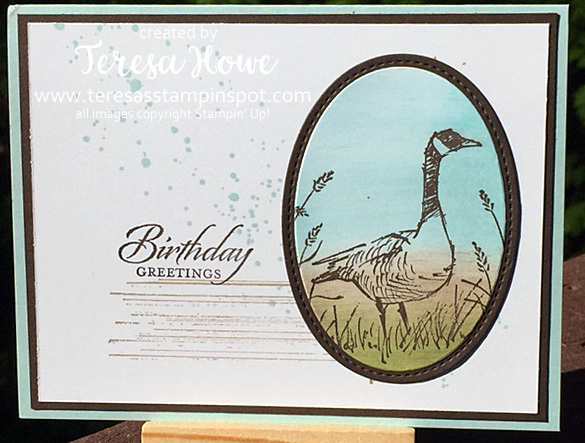 This card combines Wetlands (the main image as well as the sentiment) and Gorgeous Grunge. I love how it turned out! If you struggle with masculine cards – I highly recommend purchasing these two sets! You’ll find them in my on-line store. For the main image, I sponged Old Olive, Crumb Cake and Soft Sky on a piece of Whisper White scrap. I then stamped the bird and the wheat with Early Espresso ink. The image was then die cut with the Layering Oval Framelits. This was then attached to an Oval die cut with the Stylish Stitched Oval in Early Espresso. 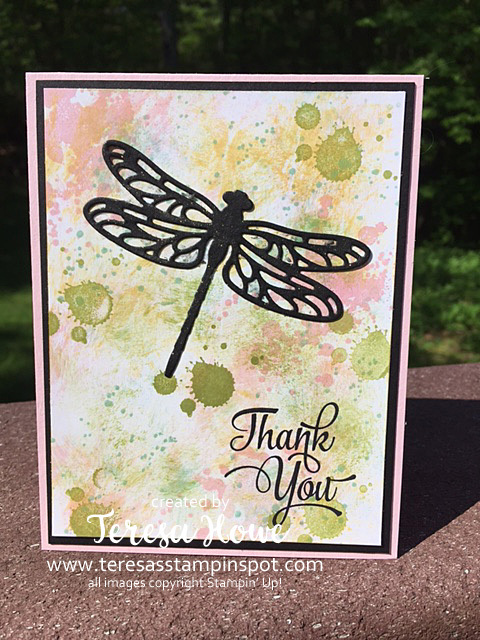 The background was stamped using Crumb Cake and Soft Sky. The sentiment is stamped in Early Espresso. Hi! A day late with this post – but just as true today as it was yesterday. Here is the card I made for my mom to celebrate Mother’s Day. 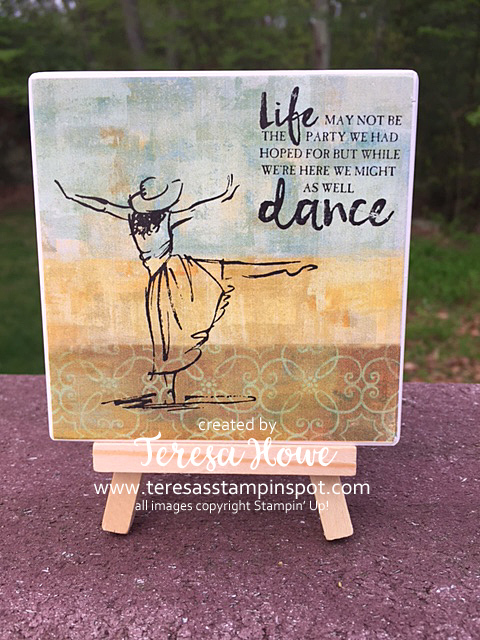 This card was made using the That’s The Tag stamp set – such a great bundle if you haven’t gotten it yet. It’s on the retirement list which means after May 31 (unless it sells out sooner) – you will not be able to get it anymore. You’ll find it in my on-line store. 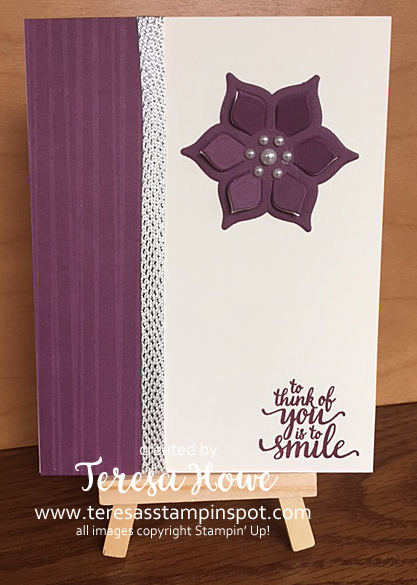 For this card, I only used the stamp set – just to show you can still make very pretty cards even without the matching framelets. I stamped the oval and sentiment in Soft Sky, the flowers in Archival Basic Black and used Perfect Plum, Daffodil Delight and Old Olive markers to color them in. 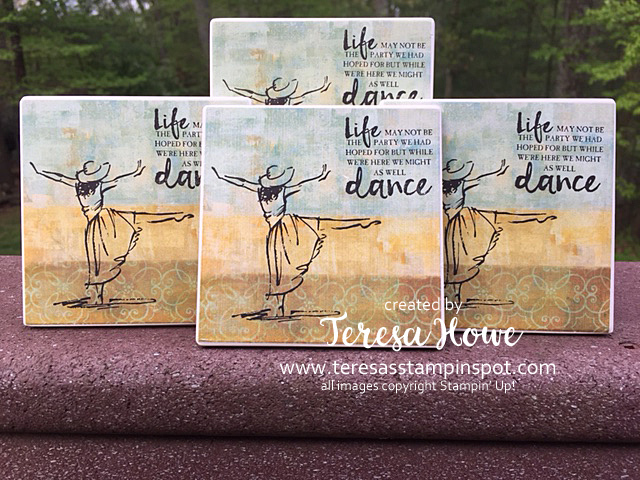 The Polka Dot Paper is from the Soft Subtles Designer Series Paper stack. And now – for a giveaway!! We hit 100 followers on my blog so I think that is cause to celebrate!! 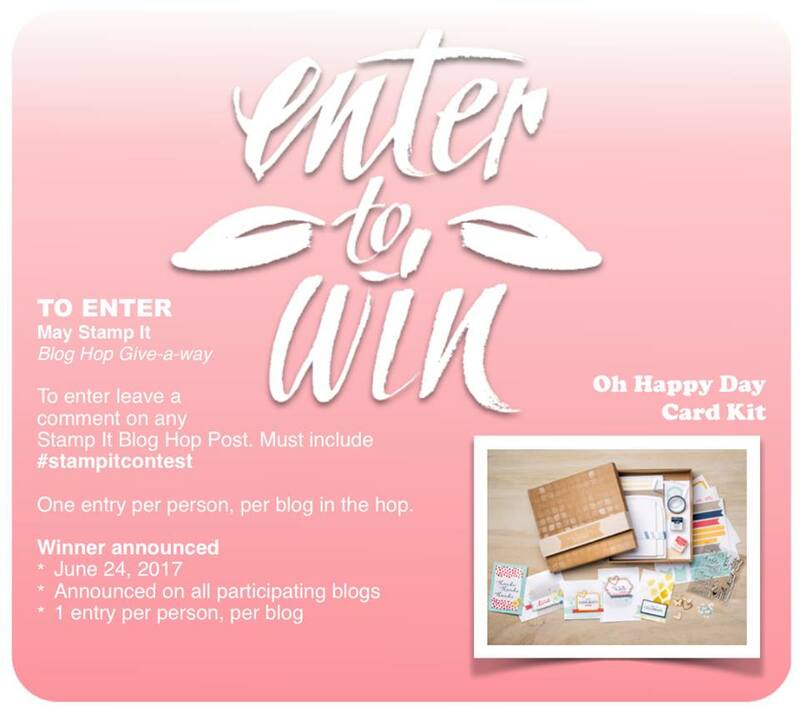 Leave a comment below by Sunday, May 21st and you will be entered to win this Hey You stamp set and card kit! Hi! 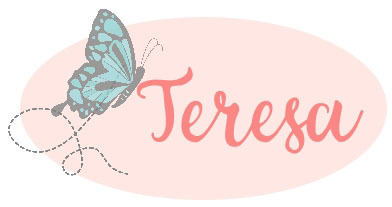 Back today with another peek for this month’s Stamp Set of the Month – That’s the Tag! Today I am featuring a few little tags. This first tag shows uses the coordinating Timeless Tags dies with a touch of coloring. Love how quick and simple the tag is – and wouldn’t it look cute attached to a gift? With end of the school year fast approaching – this would be great as an adornment on those end of year teacher or bus driver gifts. This little set of tags are mini 3×3 tags perfect for letting someone know you appreciate them. Just wanted to show the stamp set can be used without the dies as well. The tutorial will be sent out on May 15th. 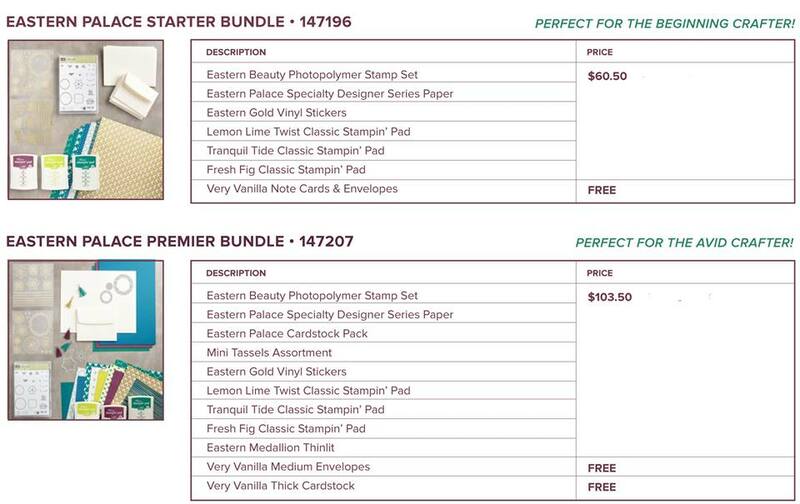 Order soon – the framelits in this bundle are on low inventory!! Sneak Peek – Eastern Palace! Hi! 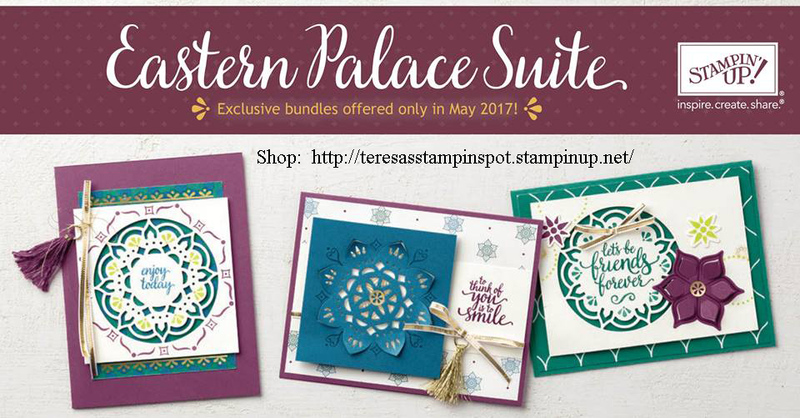 Today I have a sneak peek of the new Eastern Palace suite of products! And the best thing about this – YOU can get it now!! 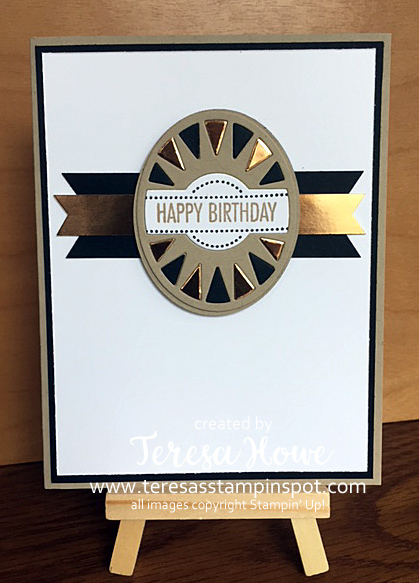 I made this card using the new dies and stamp set. The colors are Lemon-Lime Twist, Fresh Fig (2 of the new In Colors!) and Dapper Denim! Love the new colors – and you will get 3 of them in the bundles being offered this month. Here are a few other samples made by Stampin’ Up! If you missed it – check out this month’s Stamp Set of the Month – posted on Tuesday! Hurry – because the featured products are on the retiring list and are already low on inventory! You won’t want to miss it! Check it out here. 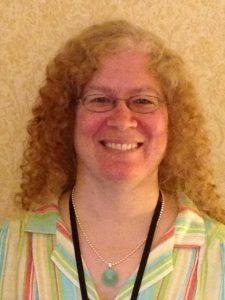 Author TeresaPosted on May 4, 2017 Categories CardsTags 2017-18 Annual Catalog, 2017-18 In Colors2 Comments on Sneak Peek – Eastern Palace! Hi! 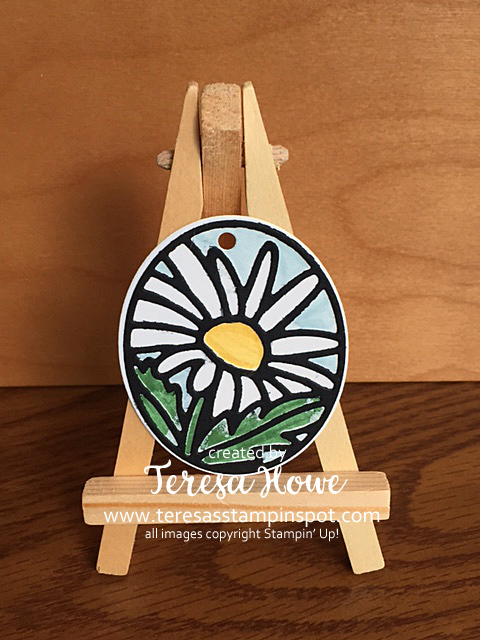 Today I am introducing the May Stamp Set of the Month – That’s The Tag Bundle!! I want to show you a little different look achieved with the That’s the Tag bundle. While I love this bundle and am sad it isn’t carrying forward, I hadn’t thought about how it could be used for masculine cards. Well, if you thought the same – I have a card today that will make you think again. What do you think? I love the clean look of this card. And while I didn’t capture it completely, the little triangles alternate between Copper Foil and Basic Black cardstock. It is just striking in person. Thanks for stopping by and I hope you’ll join in the fun of this month’s Stamp Set of the Month!